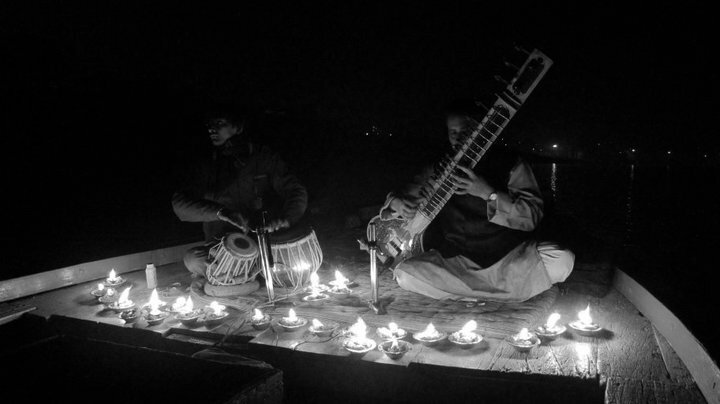 Sitar and tabla concert on the Ganga. – Had a GE-OS recording session in Varanasi. – Visited the Sarnath deer park/Buddha monument. – Bought some black-market booze from a convenience store (Varanasi is a dry city), drank, watched Armageddon and debated everything from racism in Australia to LOST (which is awesome). – Bought a black-market SIM card. – Bought a portable harmonium. – Took a night time boat ride by candlelight on the Ganga, featuring a private sitar and tabla concert (see picture to right). – Took a 40 hour train ride to Chennai. Highlights included the loudest snoring man in history (sounded like a pig smoking a bong) and money grubbing transvestites who tried to feel me up while I was sleeping (…seriously). – Ate KFC at the mall. – Saw an amazing experimental jazz performance. – Pumped myself full of cold and flu tablets (pseudoephedrine is the bomb) and took a 12 hour bus trip to Kerala. – Spend another day in bed and a sleepless night throwing up. – Took a trip to the hospital and discovered I had a temperature of 40.5oC due to a chest infection. Was given two injections and five different types of drugs. Total cost: around $6. – Took a boat ride while I began to recover. – Took a bus ride to the beach. – Took a 28 hour train ride to Mumbai (no snorers or trannies!). – Spent nine hours in Mumbai sightseeing around the local gardens, stations and beaches. – Ate McDonalds at the train station. – Took a seven hour train ride into I-don’t-know-where and spent the night. 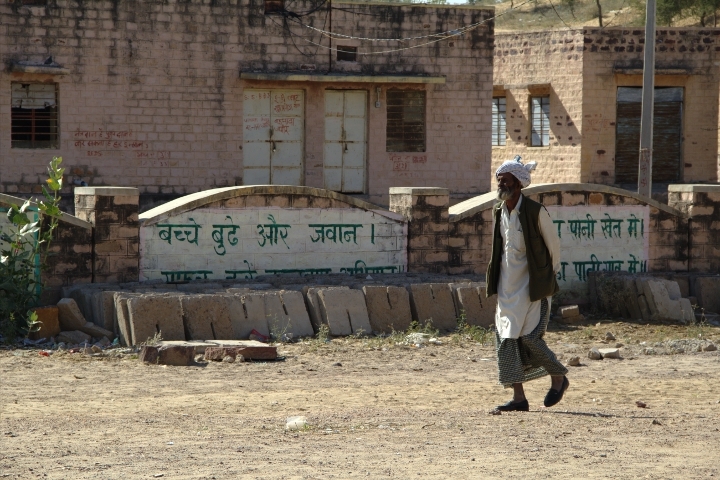 – Took a ten hour sleeper bus into Rajasthan. Highlights included a giant Shiva statue in the middle of the desert and a cow being pulled from a construction hole by a crane (it’s salvation resulting in much celebration from the locals). 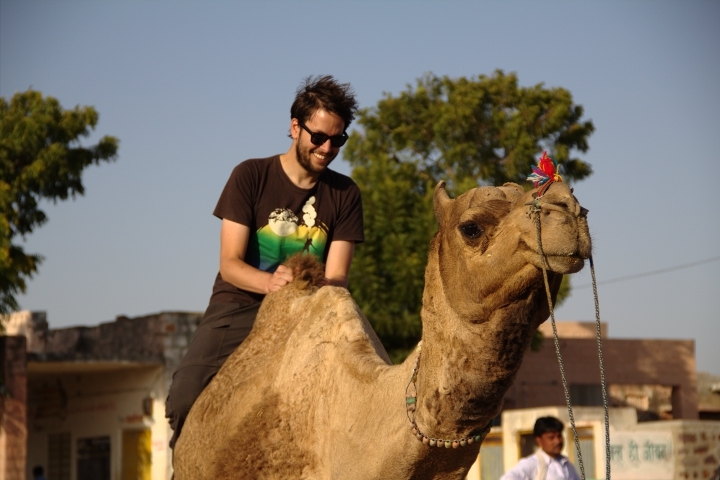 And now, after travelling through most of India, I am here in the desert region of Rajasthan! 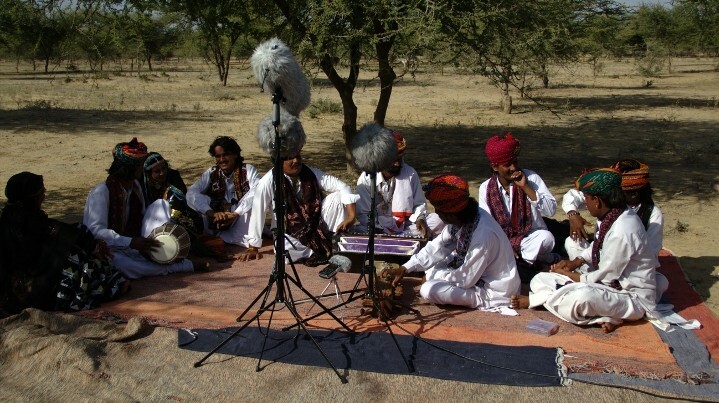 This morning we are heading to a small village outside of Balotra to record an ensemble of Manganiyar musicians known as Bundu Khan, named after their main vocalist. I’m so excited to be recording again, after falling sick I missed out on a number of sessions and haven’t hit the record button in what seems like forever. Major withdrawals here! 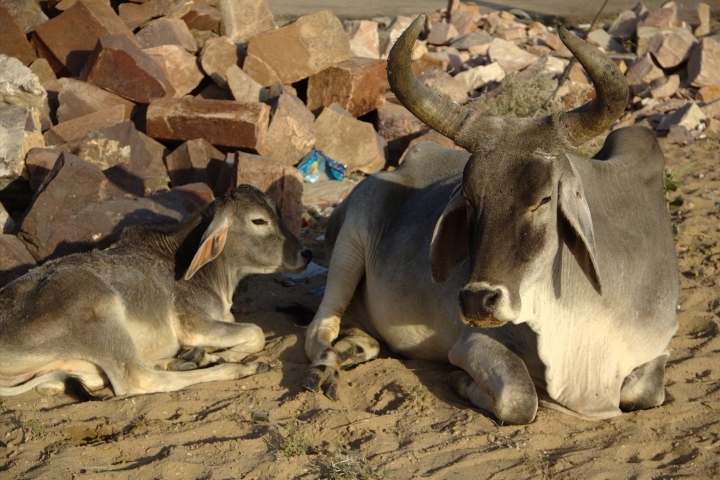 One of the many cows seen throughout Rajasthan. Leaving our hotel, the Malani International in Balotra, we pack into three four-wheel-drives and head off down the long dusty roads towards the village. The landscape here is very barren. Long plains of sand and dust stretch out to the horizon, small hills and dry trees scattered between vast areas of nothingness. Every now and then a large cow or two is spotted lounging by the side of the road (see picture to left). It seems that the further we travel through India the larger the cow’s horns get! 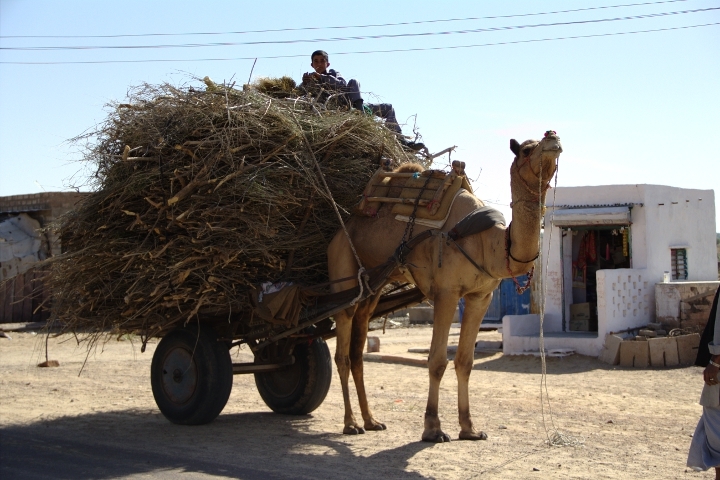 As we drive along we pass through a small town, many of the locals pause to watch our 4WDs drive by as we wind in and out of the tight streets before emerging back into the desert. A village in the desert. After almost an hour we enter a small village (see picture to right) where our vehicles come to a halt. We pile out into the bright morning sun and I take a look at my surroundings. Across the road is what appears to be a small school, a welcoming party outside its gate awaits us. Collecting my backpack I make my way over to a small table where one of the local girls greets me with a bow and places a lei of yellow flowers around my neck. I bow graciously before they dot my head with a red bindi and some rice. Smiling I enter the gates of the school and take a seat with some of my fellow GE-OS travellers. Greg Simmons, our fearless leader, along with our Nepali guide, Dil Gurung, have set off in one of the 4WDs to find a suitable spot for our recording session. In the mean time the rest of us wait. 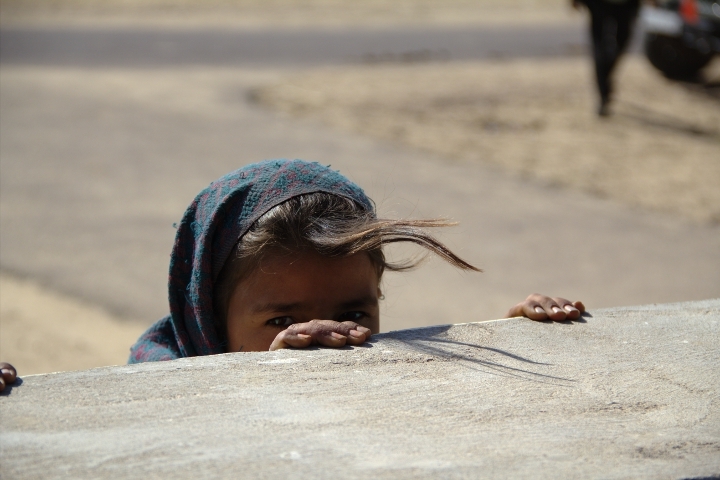 A local girl peeks over the fence at us. Sitting on a fold out chair under the hot sun, we slowly begin to draw a crowd of local children. Peering over the concrete fence behind us and peeking out of the classroom doors, the kids watch as we snap photos and smile back at them. Sure enough we are soon surrounded by a group of school children who just gaze at us with interest. It would be a little uncomfortable for some, had it not already been happening for the past month of travels! The musicians jamming in the quad. As we wait on, the musicians arrive and join us in the school quadrangle, sitting down and unpacking their instruments. I watch them as they begin to play, jamming amongst themselves. Realising I should get a recording of this I jump from my seat to unpack my rig. Hurriedly, I pull out my Schoeps M/S pair and mount it atop my Manfrotto stand, plugging it into my Sound Devices recorder and switching it on. I throw on my headphones and listen intently as I position the mics. The musicians play on as I move the stand left and right, in and out, trying to achieve the perfect balance and ensemble between the instruments. Finally I establish the best spot and sit back to adjust my gain level, waiting for a loud slap of the drum to make sure it wont peak. Sitting patiently, listening to make sure everything sounds right and no other adjustments are needed I move my finger to the record button, lowering it slowly, my first recording in over a week has finally come! Then, just as my finger tip touches it’s smooth rubber surface, the playing begins to wind down and suddenly has stopped! The musicians rise from the ground and depart without a word. I’m left sitting with my headphones on, dishevelled and unsatisfied, the jam is over. Slowly I repack my rig and sit back in my seat, just as Greg and Dil return. It’s time to go. Playing in the desert. My Schoeps MS pair on the right. Leaving the school we pack back into the 4WDs and head out into the desert. A short drive later we arrive at a rather inconspicuous clearing where the musicians have placed a large rug down in the sand and are beginning to set up their instruments once more, forming a rough semicircle. Not messing about this time I unpack my rig again and position it in the centre of the musicians. Moving the stand around while the musicians sound check, I find the best position for the mics is slightly to audience right but facing back towards the centre of the semicircle where the harmonium is positioned. This keeps the consistent drone of the harmonium in the centre of the stereo image whilst offsetting the loud volume of the dholak and khartal on the left to the quieter volume of the sarangi on the right. 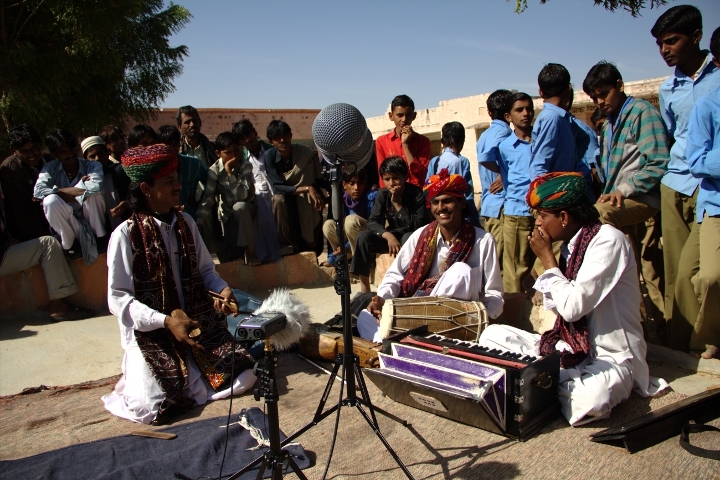 There are also two vocalists, Bundu Khan and the harmonium player, and this mic position keeps them slightly left and right of the centre, respectively (see picture above). I adjust my gain levels and sit back, eagerly awaiting the performance. The musicians actually performed four similar pieces of music for us, all of which I recorded. They were so similar in fact that I’ve decided to just include the best two, which are above; I’m quite happy with how both turned out. They have a good depth and dynamic and the musicians all play well together which comes through nicely in the recordings. Unfortunately the percussion section is at times is a little over enthusiastic and distracting, particularly in the first piece. Both of the vocalists work well together and the harmonium and sarangi can always be heard clearly. If I were to record again I may position the mic slightly further away to achieve a greater sense of ensemble. Lucky for me the position in which the new musician sat was pretty much perfect as I had no chance of adjusting the mics for this recording! What he is playing is a Jew harp, accompanied by the dholak and khartal. I love it! This is my favourite recording of the whole day and one of my favourites of the whole trip. It is so fun and energetic, the musicians are just jamming together and playing off each other and the recording has captured it very well. The two dancers spin and twirl. …With a final slap of the dholak, a click of the khartal and pluck of the Jew harp the musicians stop on a dime and the audience erupts into a huge applause. I cheer at the awesome performance I’ve just witnessed and rise from my seat on the edge of the rug. Up next is a dance performance which I’m not overly keen on, so I pack up my gear and make my way through the crowd to explore some of the vast desert around us. Some time later the performances are over and after a few quick photos with the musicians and locals it’s back to the school for lunch. Arriving back at the school we are treated to a delicious (and huge) meal of Dal Bhat as we all sit together in a large circle on the classroom floor. Once lunch is over I step back out into the glorious afternoon sun to find that Dil has organised a camel ride for us! I hurry over and eagerly await my turn atop the proud beast. Before long I’m up and the camel lowers itself to its knees in front of me. Mounting it awkwardly I grip tightly to the straw like fur on its hump before I’m suddenly thrust high into the air. The camel walks around a small clearing by the side of the road as I sit atop its back, trying to find the best position on its bony spine. It is amazing fun but before I know it the camel has dropped back to the ground below and my turn is over. Smiling I hop off and join Greg outside the school whist the others ride around. Bundu Khan, Greg tells me, has invited us back to see his village. 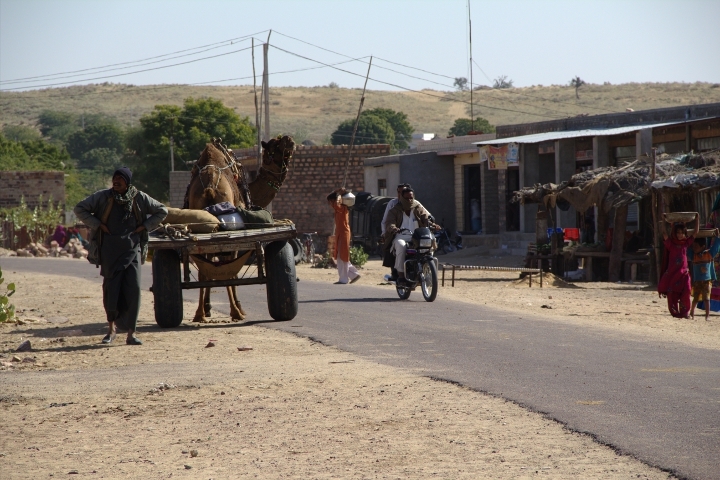 Just another days work for a local camel. 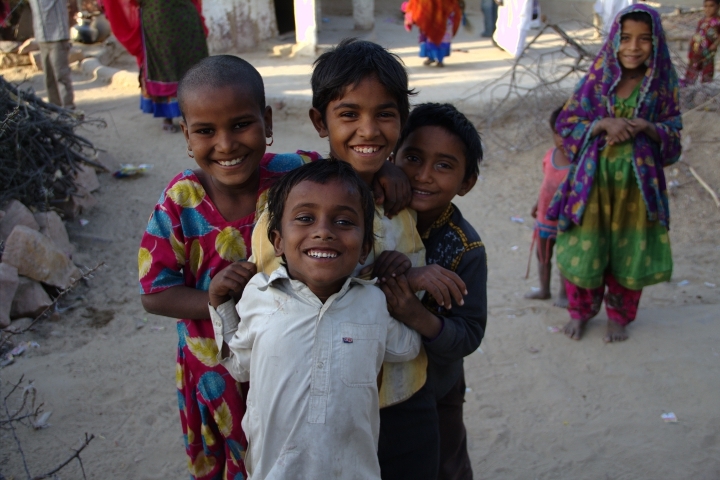 Jumping eagerly back into the 4WDs we wave to the school as we drive off into the desert to Bundu Khan’s village. A short drive later we arrive and are immediately swarmed by children. All dressed in spectacularly coloured clothes, they surround us smiling and watching. Soon enough someone whips out a camera and starts to take photos of the kids. I start snapping a few of my own and before long the kids are lining up to get their pictures taken! A few hundred photos later we are led further into the village where some benches have been placed in a circle for us. Taking a seat I can’t stop smiling. The energy in the air is electric, there is just so much joy all around. 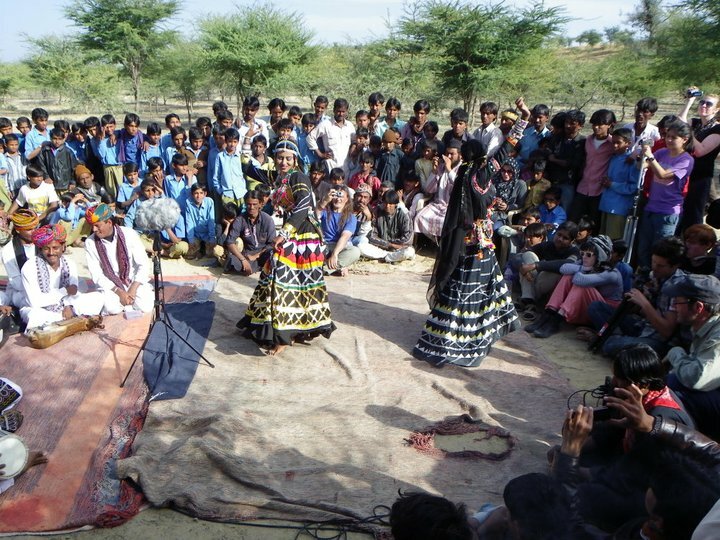 A small group of girls from the village gather together and sing for us and the rest of the village joins in. Following this, one of the local men pulls out a small metal bowl, flipping it over and resting it on his toes. He begins drumming away frantically on the bowl as he starts to sing for us too. Again it erupts into a glorious sing along with the rest of the village. 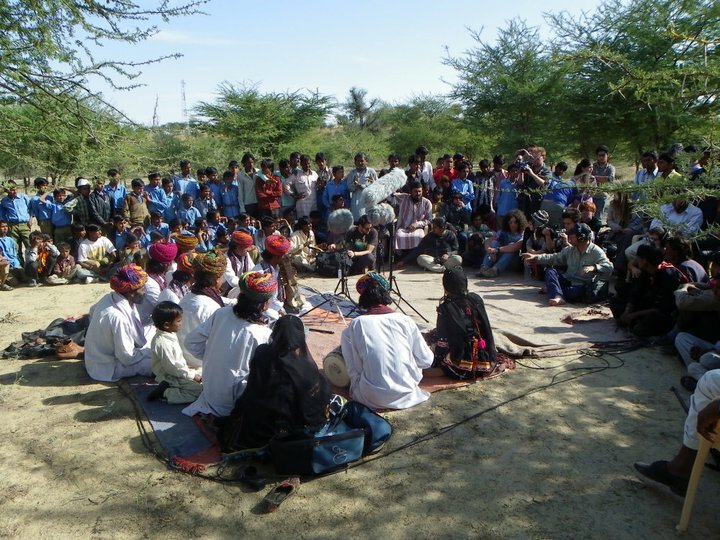 Just one of the photos of taken in Bundu Khan's village. After more singing and smiling (I’m doing a lot of that today if you haven’t yet noticed) the group begins to scatter about the village and I rise from my seat. Pulling out my camera to take a photo of the group I’m immediately swarmed once again by the local children, all wanting their picture taken. I start to take more photos of them in various combinations of friends when some of the adults start wanting their photos taken as well! Someone brings over their baby, wanting me to take a photo of it. Another mother, seeing me take this photo, brings over her baby for me to take a photo. Three babies later I’m dragged away by one of the village men that seems to be around my age to take a photo of him and his friends, then to take a picture of his horse! This goes on for some time before I finally put my camera away, telling the locals still lining up that “sorry, but the battery is dead!” I rejoin the rest of the group to find much the same has been happening to everyone else. There isn’t one face that isn’t wearing a huge smile, either from the locals or from the GE-OS crew. Walking down the dust village road. A couple of hours later we’re told that it’s time to go, but no one really wants to leave! Disappointedly we climb back into the 4WDs and wave goodbye as the village smiles and waves back. It has been a great day, one of the best days of my life! I’m still smiling as we drive back down the long desert roads. – All photos courtesy of Jarad Avnell and Jonathan Olegasegarem. I, like Sandy, came to your website via GS. You have made some amazing captures here…and you are using some amazing equipment. Thanks for sharing the adventure with us. If you get a chance, care to comment on the noise floor of the Schoeps M/S pair? It appears extremely quiet in your posted audio…just would like your opinions. Thanks!! Thanks checking out my site and for the kind words! The schoeps M/S pair certainly is an amazing piece of gear, I’m so happy with it in everyway! As for the noise floor, it is quite good, but nothing particularly special. I did a recording whilst on my trip of some birds at sunrise. The birds were quite far away so I had the gain turned up almost full. It came out as quite a noisy recording unfortunately. The Sound Devices 722 that I use also has very quiet, neutral preamps which helps a lot!